Love it! Definitely let me know what you think about the 12seconds.tv – I have had lots of fun with it and go through phases where I use it a lot (some might say too much). Really enjoying getting to know you. Hmmm…I don’t know about video. I don’t even like myself in pictures I’d probably have to skip video. 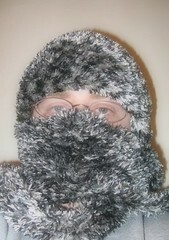 However, your bundled up picture is funny. Looks like a raccoon got ’em!